For anyone going on a cruise for the first time, there are lots of options and decisions to make during the booking process. A lot of our clients are confused by the plethora of cabin types available, so here is the breakdown of the most popular cabins on today’s ships. Inside cabins are located in the Interior part of the ships and have no windows or views of the ocean. They offer the most budget-friendly option for cruisers, but they are also the smallest cabins, many averaging just 140 sq. ft. Some of the newest Royal Caribbean ships offer a nice variation on the inside cabin called the “Virtual Balcony” cabins. These cabins have a huge screen on one of their walls projecting a current view of the ocean and making it appear that you have a window, without actually having to pay for an Oceanview cabin. Another option on Royal Caribbean are the inside cabins with a window looking out to one of the areas inside the ship. While not the same as having a view of the ocean, many people who do not like enclosed spaces, find these cabins a good option. One step up from the Inside Cabins, these rooms typically come with a porthole or a small window. Slightly larger in size than the Inside cabins, these give you a nice view of the ocean, even though on many ships the window is fairly small in size. These are usually located on the lower decks of the ship, which is actually a good location for those prone to seasickness. One variation of these cabins are the Obstructed View cabins, typically located behind or above the ship's lifeboats. Depending on the exact location of the cabin, your window may be fully or partially blocked by a boat, though you will still be able to see some of the ocean. The benefit of the obstructed view cabins is that their price is lower than regular Oceanview cabins. Some of the nicest and largest cabins on each ship are the Balcony Cabins. While they vary in size from ship to ship, these usually have a full glass wall opening onto a balcony, typically outfitted with two lounge chairs and a table. Each ship has many categories of balcony cabins, depending on their location on the ship (lower or higher deck, front, middle or aft of the ship). Most customers prefer a higher up balcony cabin in the middle of the ship, even though a lower floor is recommended for those prone to motion sickness, as there is less motion the lower you are. Some of the most coveted balcony cabins are the ones on the very back of the ship (on many ships they are called the Sunset Verandas). Larger in size than most other balconies, these offer an amazing view from the back of the ship as well as lots of privacy. On some of the Royal Caribbean ships, there are Balcony cabins overlooking the inside of the ship and offering only a partial ocean view. Those typically sell for less than the oceanview balconies and are a great alternative for the price-conscious customer. Some cruise lines, like Celebrity cruises, offer a Concierge Class balcony (where you have a personal concierge at your service at all times) as well as Aqua Class balcony cabins, where guests have access to the Spa and an upscale health food restaurant open only to people staying in an Aqua Class cabin. The largest and most lavishly appointed cabins on each ship are the Mini Suites and Suites. While Suites vary greatly from ship to ship, those usually provide the ultimate cruising experience. Some come with one or two separate bedrooms, a hot tub on the balcony, even your own piano and entertaining area. Guest staying in a suite have highest priority when boarding or disembarking the ship and tendering to various ports. On some cruise lines like Celebrity, suite guests have their own private lounge. 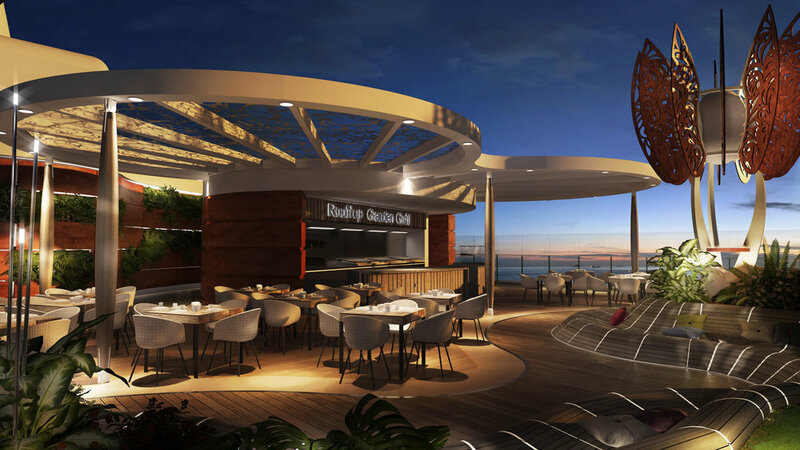 And on Royal Caribbean’s newest ships, some of the suites offer wrap-around terraces, two floors of living space, two bathrooms and amazing panoramic views. Many cabins on cruise ships are designed to fit two passengers, but most ships have a number of cabins that can accommodate 3, 4 and even 5 passengers. These choices are perfect for families with kids, though keep in mind that those cabins are limited and sell out well in advance. Depending on the ship, the 3rd and 4th guest can sleep either on a pull-out sofa, a bunk bed that pulls down from the wall, or trundle beds. Cabins for 5 are only available on several ships, so our advice to large families is to book early. One thing to keep in mind is that cabins on cruise ships are generally much smaller than hotel rooms (even balcony cabins in many cases measure just over 200 sq. ft.) so even if the cabin can hold 5 people, it may feel rather cramped inside. One option is to look for a Family or Oversized cabin, available on some ships. Those are larger in size than the typical cabin and sometimes even have 2 bathrooms or a walk-in closet. Another option for families is to get two connecting cabins, which will give everyone more space and would still allow for the parents to be close to their kids. If you are looking for the ultimate family cabin, Royal Caribbean’s Loft Villas offer everything a family may need complete with a slide in the living room. Choosing a cabin for solo travelers is a bit tricky because only a handful of cruise ships offer single cabins. 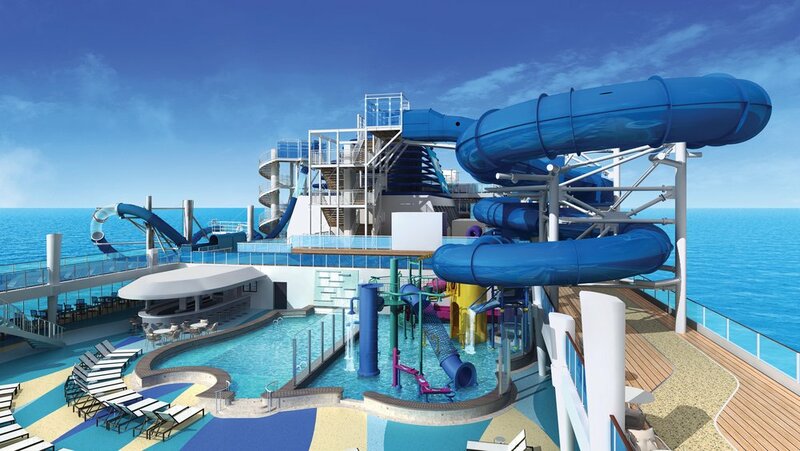 One of the best options for them is sailing on Norwegian Cruise Lines, whose newer ships offer the Studio cabins - single inside cabins located in a special part of the ship, complete with a singles lounge and special activities for solo cruisers. On most other ships, singles are required to pay the “single supplement”, nearly doubling the price of the cabin for them. In many cases, Guarantee cabins are a great option for cruisers on a budget. What Guarantee means is that you are guaranteed a cabin of your chosen type (Inside, Oceanview or Balcony) but your actual cabin number is not assigned until the day of departure. Guarantee cabins cost less than a regular cabin and there is a small chance that you may get a free upgrade, however, on the flip side, you may get a cabin assignment that is not to your liking (a cabin below a nightclub or at the very front of the ship). If you are travelling with others, it is best to secure your cabin assignment in advance, but if you are looking for a budget-friendly option on a higher level cabin, Guarantee cabins are a great alternative.